Welcome to the Hotel Medsur-Lido! If you like strong emotions, you will find the largest offer for leisure time in the Valencian Community, like Terra Mítica, Aqualandia, Mundomar, Terra Natura, y un largo etc,.. If you are going to spend several days with us, we recommend a visit to some of the pretty local villages like Altea, Guadalest, Villajoyosa, natural spots such as The Fountains of L’Algar ,and many more options. Our reception staff will be pleased to inform you and assist you with whatever you need. Music is as important in Benidorm as the sun, the sea water and its beaches. The Low Cost Festival, The Iberia Festival, the Salsa Congress are just some of the music events which take place during the year. If you prefer to enjoy doing nothing, you can chill out peacefully at the hotel enjoying our swimming pool. You mustn’t miss the sunset from the terrace of our café enjoying a refreshing drink. 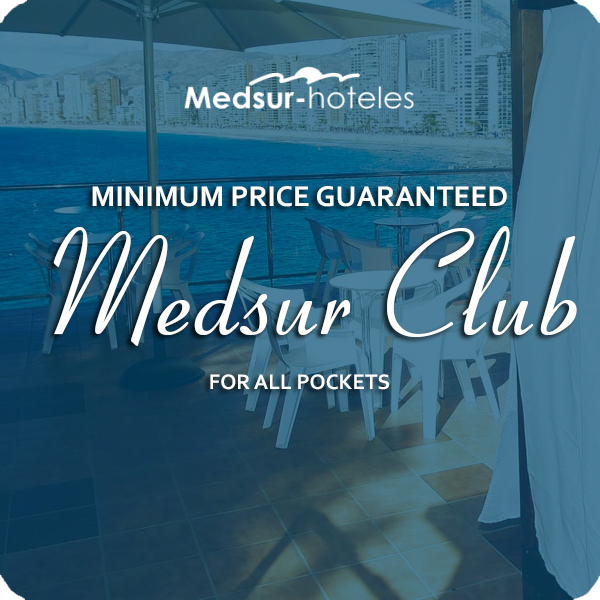 For all this and much more, Hotel Medsur-Lido and Benidorm are an ideal destination to enjoy the sol and the beach with your family, and also our famous offer of both daytime and evening leisure, or why not, a relaxing escape with friends or a partner. Recently reformed, the Hotel Lido, has 64 spacious exterior rooms. They are supplied with two beds of 1,35 mts.,a full bathroom, complimentary articles, heating and air-conditioning, flat screen T.V. and telephone. If you would like a view of Benidorm Bay , when you wake in the morning, you can reserve one of our rooms with a sea-view at a small extra cost per night. If you are travelling in a group, family or friends, and need several rooms, you can mark this on the reservation form and we will try our hardest to give you adjoining rooms or as near as possible. The maximum capacity per room is of 4 people in 2 beds of 1,35 mts. Are you hungry? 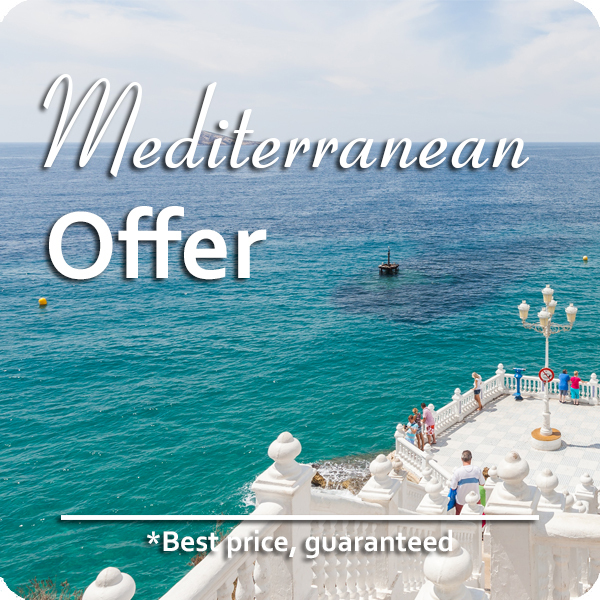 Do you fancy starting the day with breakfast in front of the Mediterranean Sea? We want you to know us a little better, that is why we introduce local products and recipes for you to get to know the gastronomic culture of the area. We offer a long list of drinks and enjoyable cocktails in our café. Don’t forget to ask for our special offers and contests. From 11.30 am. to mid-night Summer /Winter. Take your own photo with us, share it on Instagram o Twitter and enjoy special offers and discounts in the café. We want you to enjoy the food during your holiday. If you are a Celiac or have a food allergyof any sort, don’t doubt in letting us know. Comment it on your reservation or tell us at reception when you arrive. The person in charge will contact you in order to prepare the menu for your stay. Evening meals : 19:30 hrs. – 21:30 hrs. We want you to get to know us, that is why, if you wish to have lunch or your evening meal in another of our hotels in Benidorm, Hotel Tropic Relax u Hotel Alone, you only need to let us know in reception the day before. A happy stay begins with a cordial welcome. We are thrilled that you come to visit us. That is why we will be pleased to help you in any way that we can. We are ready to answer your questions and solve your doubts so that you enjoy your stay 100%. If the day you are leaving you need to stay in bed a bit later or you wish to spend a while in the swimming pool and get changed later, you can request a (late check-out the day before in reception, depending on availability and cost. The dogs under 5 kilos in weight are welcome in Hotel Lido in rooms with a terrace and a sea-view. It is necessary to consult the availability of this kind of room before making a reservation and to warn us that a dog is travelling with you. Rooms with a sea view, have a supplementary cost per night. We want to talk to you. Follow us on Facebook, Twitter and Instagram. If you are travelling here by car, you just leave the AP7 motorway at the “Benidorm Centre” exit. From there, it is about 3 kilometers to the hotel. If you prefer to travel by bus, you can catch a local bus at the bus station which will drop you 200 meters away from the hotel. With regard to the train, for the last few years Renfe have a station in Alicante which has had a service with AVE(the fast train) from Madrid. From there you can decide whether to continue the journey by bus, FEVE (local track railway connecting Alicante with Denia) or more comfortably by taxi. Lastly, from the airport called Altet, you can catch a bus which connects with the bus station in Benidorm, a transfer which you should reserve beforehand, or if you prefer, a taxi which has a rank at the Arrivals and Departure sections of the airport.